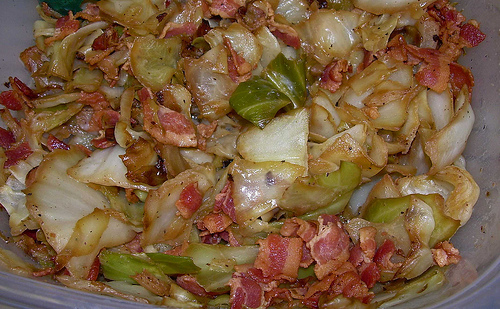 Place the bacon in a large stockpot and cook over medium-high heat until crispy, about 10 minutes. Add the onion and garlic; cook and stir until the onion caramelizes; about 10 minutes. Immediately stir in the cabbage and continue to cook and stir another 10 minutes. Season with salt, pepper, onion powder, garlic powder, and paprika. Reduce heat to low, cover, and simmer, stirring occasionally, about 30 minutes more.